Since reaching an intraday high of 18,351.36 on May 19, the Dow Jones Industrial Average has dropped 11.6% through today. That puts us squarely in correction territory and has led to many readers asking us how to invest during a stock market correction. For the answer, we turned to Money Morning Executive Editor Bill Patalon. He has more than 30 years' experience as an analyst of business, economics, and the financial markets. He's also the award-winning author of "Contrarian Investing: Buy and Sell When Others Won't and Make Money Doing It." 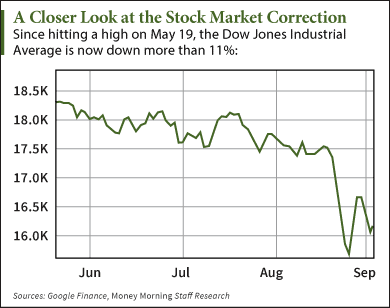 A stock market correction is defined as a 10% drop from an index's high. While it's not considered a bear market – that's after a 20% drop – a correction usually causes many investors to hit the panic button. But taking your money out of the market is the wrong move. You see, great stocks are trading at a discount now. And you don't want to miss profits when the markets inevitably rebound from this stock market correction. In fact, we recommend having a list – ready at all times – of quality, must-have shares to pick up at "fire sale" prices during sell-offs. So we asked Patalon which stock tops his must-have list now that shares are on sale. "I like the stocks of companies that are tied into long-term trends and whose share prices are poised to benefit from multiple catalysts," Patalon said. And the company Patalon recommends now is benefiting from several solid catalysts. trying to figure out why he is saying the oppisite of kent moors ?? Please advise the list of "experts" that you know of that foresaw the crash of oil in 2014 before it happened and advised their clients as well as published their foresight to the financial newspapers.